Detroit Tigers slugger Miguel Cabrera became the first player since Carl Yastrzemski in 1967 to win the triple crown. 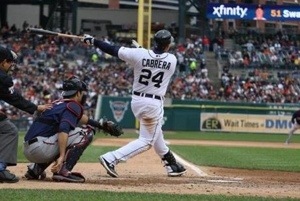 Cabrera led the AL in homers with 44 and 139 rbi’s while batting .330. Even with this amazing fete there is still the debate over who should win AL MVP, Cabrera or Angels superstar rookie Mike Trout. Who is your AL MVP? Lets us know below.